A. Do I need to activate the trial version? No, you don’t need to activate it. 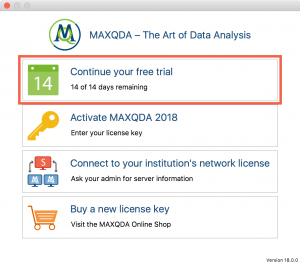 Simply click on Continue your free trial in the MAXQDA welcome window to continue using the trial version. The trial is valid for 14 days. You can unlock the trial at any time with either a serial number or connect to a network license.